It's Wednesday, and time for another Fabulous challenge at Cuttlebug Challenge Blogspot! :) Be sure to play because there is a great prize up for grabs! So what's the challenge? Just incorporate FABRIC into your cuttlebugged projects!! 1. Make a project using fabric! This will get you 4 entries into the prize drawing to win. Then upload your project to your blog, or any online gallery, (leave the links on our Mr. Linky. 2. Don’t have time to create a project? Leave a comment for 1 entry in the prize drawing. Don't delay ~ this Cuttlebug Challenge ends on February 16th 11:55 pm EST. 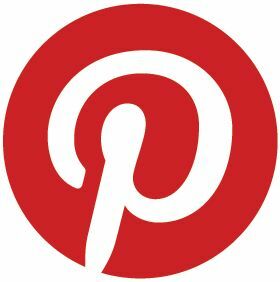 To help INSPIRE YOU, go check out what the Fabulous Cuttlebug Challenge Blogspot Design Team has come up with! So have fun, and good luck!! Thanks for looking & Happy creating! Totally awesome, America!!! I just want to reach out and touch it! So warm and pretty! Beautiful layout and love the warm colors. Now that is one very cool masculine card! The colors and the textures on it are so vivid and I love every bit of it! Loving that fabric too! Super card, it was worth any and all injuries! This is gorgeous! I love all the texture it has to it! This is a gorgeous card you have made!! love all of the layers and embellishments!! This one is my favorite this week!! Love your work America! Excellent! What a beautiful and rich looking masculine card America...you've really capture a very handsome feel in this card. Beautiful card America!! I love all the texture!! 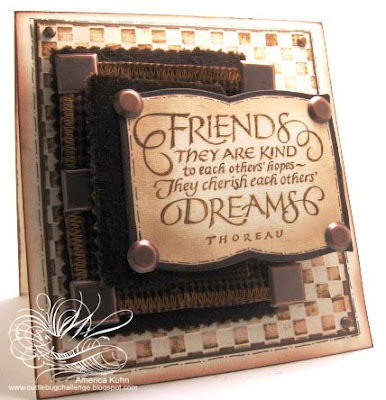 The rich colors and design with the spellbinders die for the sentiment is gorgeous!! Love your masculine card!! Stunning! Hi America this is another BEAUTIFUL creation!!!! I am sooo glad you stopped by and paid me a visit cause I LOVE your blog you have a new stalker...LOL!!!!! Have a wonderful weekend!!! LOOOOOVIN' all the cool textures on this! Hehe, good for you for sticking with that machine to get the stitching. I can relate...I just recently got a Janome Sew Mini and had my share of threading the thing wrong where the stitches weren't coming out right. I think my struggle is that flippin' BOBBIN...ugh! Sometimes it's just so STUBBORN! So beautiful America,i love your papers and colours.